For anyone not following the Hugo Awards (sci-fi/fantasy literary awards), there has been a huge upset this year, based on changes in the genre over the last several decades, and the larger sci-fi/fantasy (SFF) community. In essence, women, queer folks, and people of color have been increasingly taking up space in the genre. A number of community members who liked things the way they were are upset, and staged an awards coup. You can read about the details here and here, but I am most interested in exploring two related dynamics: first, the complaint that the genre was being taken over by people with a “social justice” agenda, and the corrollary question of what is the deep attraction/fascination that binds people to a particular genre. @The7thMatrix Right? Like if they replaced the b-word w/ "powerful, attractive woman." Take that, you powerful attractive woman+be insulted! Also, increasingly, women of color are finding space in the SFF community, from early vanguard work of Octavia Butler, to Tananarive Due in a 2nd generation, to a new generation. 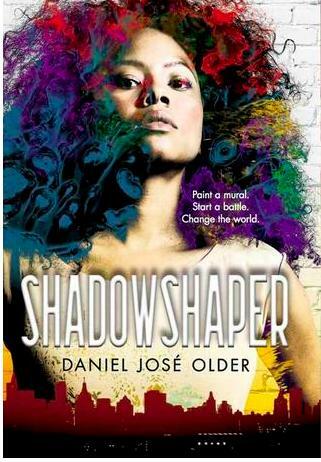 This includes highly political WOC SFF feminist critics like Mikki Kendall, to men of color who write female protagonists and think critically about writing from various perspectives, like DJ Older. Meanwhile, it makes sense that the traditional white male core audience of SFF from decades past wouldn’t have a massive activist agenda in the world, because the structures of the society generally supported their well-being. However, with an influx of people of color, queer folks, and women into the genre—people who find themselves targets of institutional oppression in the society—visions of the future would necessarily include grappling with these issues. One of the biggest social justice coups of the year was the groundbreaking anthology Octavias Brood by veteran SFF lovers and WOC activists Adrienne Brown and Walidah Imarisha. They began with the hypothesis that all social justice work is SFF because it’s about envisioning a different future. Over the past two decades, with the rise of the internet, POC, women, and queer folks can find books with our stories online, even if they aren’t in our local library or bookstore. The last decade has seen a rise of intersectional nerdery/geekery from Junot Diaz winning the Pulitzer with a book about an AfroLatino Caribbean nerd protagonist, to Black Girl Nerds, Black Girl Geeks, Black Girls Code. Or Renina Jarmon who posits that Black Girls Are From The Future. However, for those of us who grew up before the internet, many of us genre-loving black girls thought we were the only one. And as we increasingly participate in the SFF/nerd community, both online and in fandom, we bring our issues. That is to say, our consistent dissatisfaction with a society where we are systematically denied human rights and targeted for violence. As readers and writers, we crave in our fiction to have visions of the future that support our humanity and affirm our continued existence. Every genre has its yearnings. Romance – yearning for someone to rescue us. Mystery – a need for justice and to have some unanswered question answered. Spy thrillers – the inability to be seen and known. Serial killer and stalker thrillers – about anxiety and dreaded anticipation of violence. Heist – a belief that the wrong people have triumphed in society, and a need to change that. This is not to say that every reader in every genre has this particular psychological issue. However, these are some of the central emotional/political issues in the genres and part of their appeal. Some of my thinking in this area was initially sparked by Bay Area author Claire Light. at a birthday party for Kenyan author Shailja Patel, in which Light–as a feminist–fervently defended the romance genre, and pushed me to question my assumptions. It also pushed me to embrace my inner-romantic and find ways to join the growing numbers of authors who bring our feminist perspectives to romance storylines. So I have become curious about what underlies our attraction to different genres. For example, heist is my genre. #FeministHeist, to be specific. 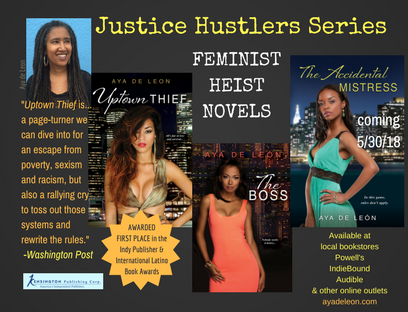 I am most certainly preoccupied with a sense of injustice at the current distribution of resources in the world, and in the novel series I’m writing, I’m excited about women of color who move some of that money around. From my tweens to my twenties, I read mystery (and a bit of spy genre), but lately I have become fascinated with spy/heist. In fact, I’ve pretty much lost interest in mysteries. Maybe all that therapy paid off and I got the answers I wanted! In other genres, I have read a bit in SFF, but it doesn’t call to me in the same way. Still, I do have nostalgia for many of the old SFF images. For the photo to accompany this post, I selected Tananarive Due dressed in Star Trek gear. Due reminds us of Nichelle Nichols as Lt. Uhura. Yet Due wasn’t sitting with her headset on, waiting for Kirk to tell her what to do. 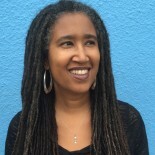 Due is a veteran, award-winning writer in her own right, and was a co-host of the Hugo awards this year. Due is not only highly political in her writing, she comes from a multi-generational activist background. I think SFF has historically been many things to many people, including a refuge for white men who felt alienated by the society and wanted to escape to other worlds. There’s a reason it’s called fantasy. For that crowd, all these POC, women, queer folks, and our issues and our books that include our issues, are a buzzkill. They didn’t come here to make change. They came here to escape. Yet the very struggle at the Hugo awards shows that the political challenges of our time are inescapable. In other words, if you came to this planet to escape the problems on your own planet, you’d better start dusting off your spaceship and prepare to keep it moving. Find another planet, guys. The Hugo Awards aren’t going back. Good piece on science-fiction and its roots in marginalized struggles! This entry was posted on August 23, 2015 by Aya de Leon in Uncategorized.